The white water rafting trips at Smoky Mountain Outdoors provide an opportunity for your family to bond as you work together to achieve a goal. As you and your family work together to make it through the trek, you exercise those important social and teamwork skills that will inevitably translate to your day-to-day lives, making you and your loved ones closer as a whole. When you go white water rafting, you don’t have to worry about anyone having to miss out because age or height like you might when your trying to choose a movie to go see or visiting a theme park. A white water rafting trip with Smoky Mountain Outdoors is suitable for nearly all age groups, and absolutely no prior experience is required! Children as young as three years old can participate in our mild Lower Pigeon River rafting trip, which features mainly class 1 and 2 rapids. 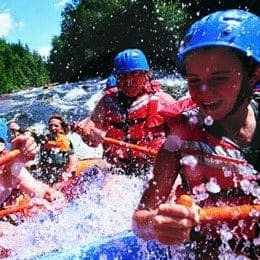 Kids who are at least eight years old or 70 pounds will love our exciting Upper Pigeon River rafting trip, which offers exhilarating class 3 and 4 rapids. The process of getting from point A to point B while white water rafting in the Smokies with your family is an adventure all on it’s own. Add the amazing things you’ll see while you’re on the river and a big rapid or two and you’ve got an experience you and your family will cherish for years to come. 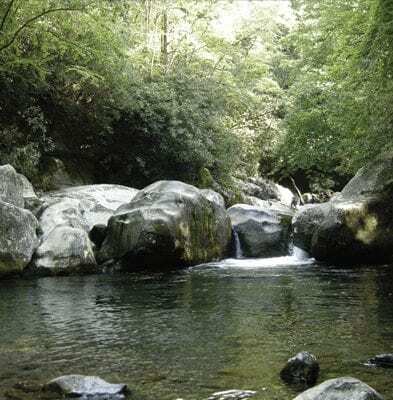 You’ll see a different side of the Smokies – and yourself – during your water excursion. Luckily, every trip down the river is different, so you and your family will be able to come make new ones as often as you want. We know you’ll love spending the day on the river with your family and all the perks that come along with it. Start planning your white water rafting in the Smokies trip today!